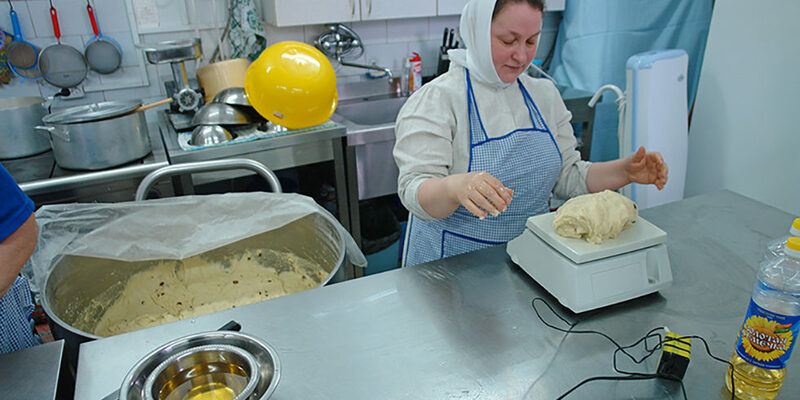 On April 10, the Seraphim-Diveyevo Monastery began annual baking of Kulich breads. 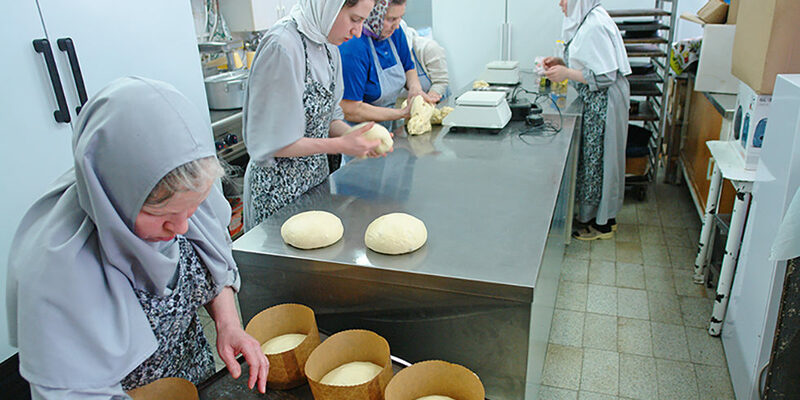 Despite we are still at the fifth week of Great Lent, the monastery is awash with the sweet fragrance of freshly baked kulich breads; 1000 of them is to be baked before the feast. Before the beginning of baking, prayer service was served for success of a good deed. 1. In lukewarm water (150g or 5.3 oz), dissolve 50g (1.7 oz) of active dry yeast, add 1 leveled tbsp. of sugar. Mix with hands. Let is rest. 2. Add 0.5 l (2 cups) of warm milk and 400 g (0.9 lbs) of flour. Mix with hands. Cover and let it rise in a warm place for 10-15 min. 3. Add 15 eggs and 700 g (1 1/2 lbs) of sugar. Beat in a blender or with a mixer for 15 min. 4. Add 250 g ( ½ lb) of softened butter at room temperature (if using salted butter, omit salt), 100 g (3 ½ oz) of cooking oil, and zest from 1 lemon. Mix with the rest. Gradually add 1.5 to 1.7 kg (3 1/3 to 3 2/3 lbs), plus 1 leveled tbsp of salt. 5. 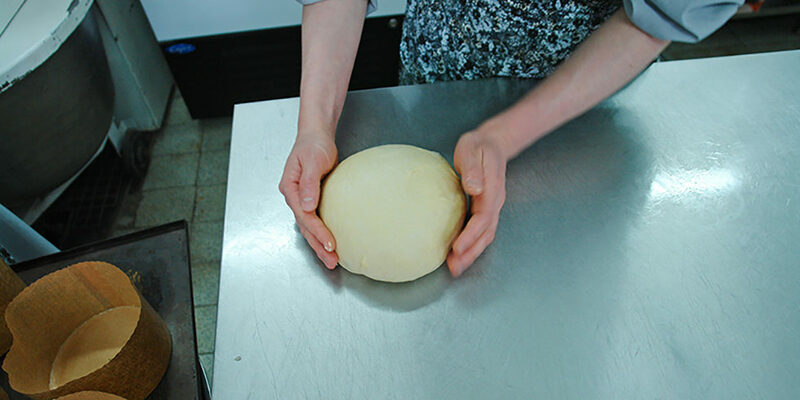 Mix the dough well, cover the bowl and let it rise in a warm, draft-free place approximately for one hour. 6. Once it rises, mix in 150 g (5.3 oz) of raisins (well-rinsed and checked for any remaining twigs) and vanilla essence (1 ½ tbsp. or less). 7. Fill well-oiled (cover bottoms of pans with circles of oiled baking paper) baking pans with dough immediately. 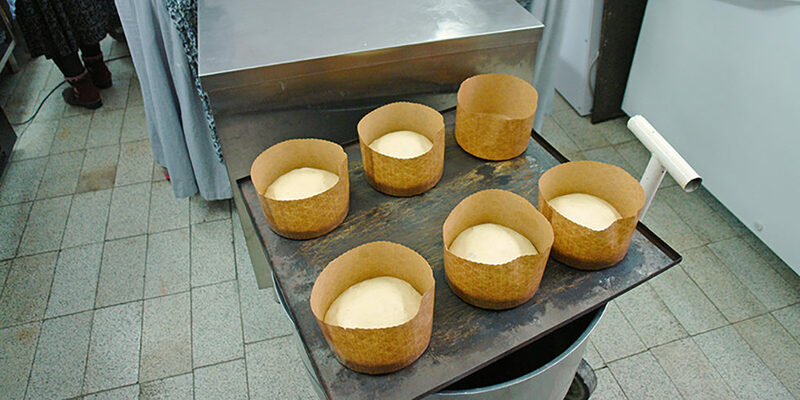 Trying not to handle the dough too much, flatten the top of each kulich. Remove any bits of raisins sticking out on top. 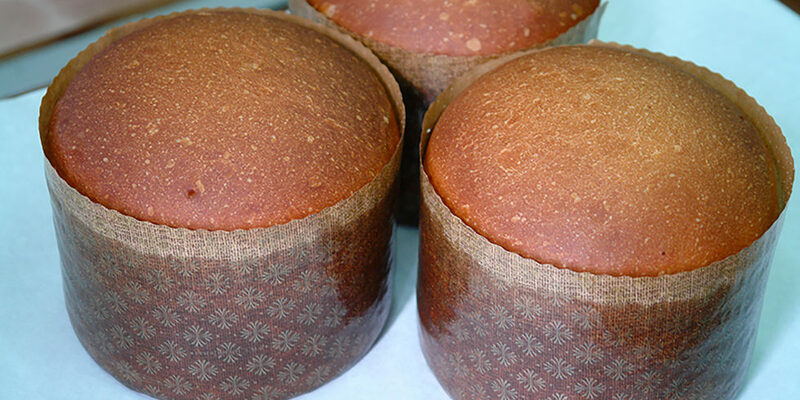 Poke the whole kulich with a thin wooden stick (or a knitting needle) in four places. 8. Let the pans stand in the warm, draft-free place for another hour. 9. Bake kuliches at 180C (350F) for 30 to 50 minutes (time depends on the size of the pans) until golden. 10. Take out of pans and let rest on a wire rack.